Picking the first stems of rhubarb from our Hitchin allotment is always a thrill. There is little to bring home from the plot and enjoy at this time of year, April is more about preparation and seed sowing for the season ahead. I think because of this the first rhubarb picked and eaten has a pleasure all it’s own. 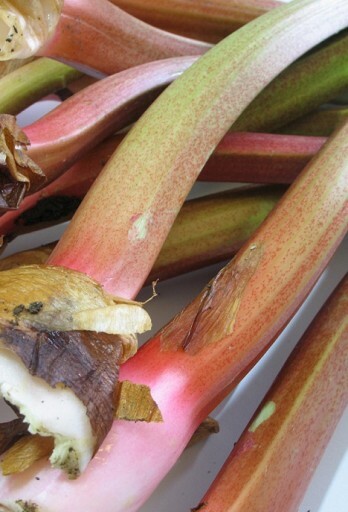 Rhubarb is also fantastically easy to grow and totally undemanding. If you have a spare space in the garden then planting a rhubarb crown is a must. Plant them in either the spring or autumn with planty of manure or compost as they are hungry feeders. Water them in dry weather and the rest is magic. We have 3 crowns on our allotment which easily feeds our two families. As well as traditional rhubarb crumble I love Nigella’s ‘Rhubarb Cornmeal Cake’ in her How to be a Domestic Goddess Book. I even have rhubarb for breakfast, it makes a great compote and gets added to my muesli and yoghurt! The best recipe for this is from River Cottage and you can find it here.